The high water storage capacity of minerals in Earth’s mantle transition zone (410- to 660-kilometer depth) implies the possibility of a deep H2O reservoir, which could cause dehydration melting of vertically flowing mantle. 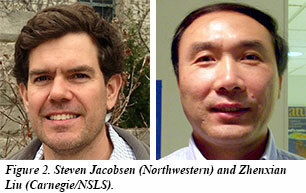 In recent work, CDAC Partner Steve Jacobsen (Northwestern), Carnegie-CDAC Research Scientist Zhenxian Liu (NSLS) and colleagues from the University of New Mexico, University of Southern California, and University of Wyoming have used a unique combination of synchrotron infrared spectroscopy, TEM, numerical modeling, and seismic P-to-S conversions recorded by a dense seismic array in North America to examined the effects of downwelling from the transition zone into the lower mantle. 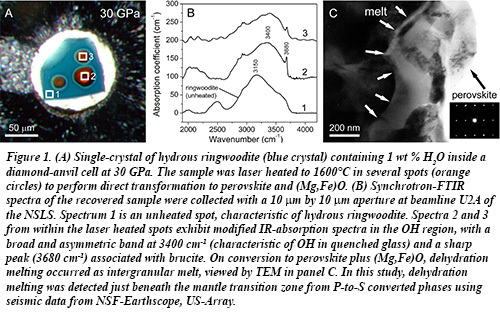 In experiments, the transition of hydrous ringwoodite to perovskite and (Mg,Fe)O produces intergranular melt. Detections of abrupt decreases in seismic velocity where downwelling mantle is inferred are consistent with partial melt below 660 kilometers. These results suggest hydration of a large region of the transition zone and that dehydration melting may act to trap H2O in the transition zone [Schmandt et al., Science 344, 1265-1268 (2014)]. Their research was also featured in an article in USA Today.